Cute, cute, cute card! Do you think that the Silhouette cuts better than the Cricut? oh my thats a cute card. such fun colors to go with it too. Question, for silhouette sd and mtc, when you installed the "controller", do you need the "drivers" installed as well? @ConnieB-I read that I needed to so I did all that (installed controller and drivers) before I hooked the silhouette up. When I plugged in the Silhouette, the computer said it needed to look for the hardware (which I am assuming was the drivers) and it had to look for it and then it installed. I'm thinking it probably installed it from the prior installation I did so I would be sure to install both. I downloaded them from the graphtec website. So unique and just adorable! LOVE that shape. Oh Gale, this is so tweet! 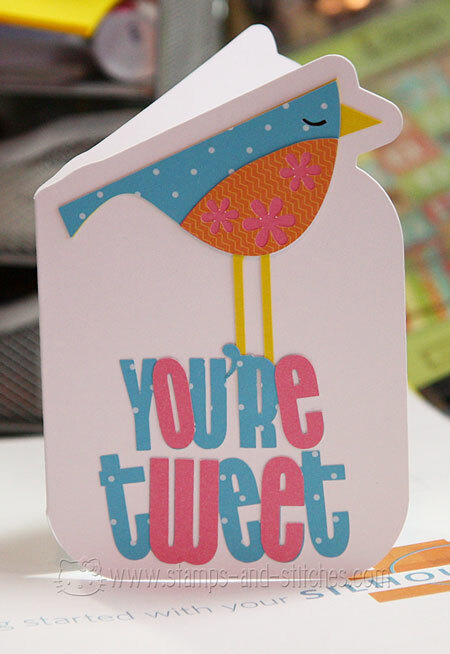 Love the cut of your card ... adorable! Pretty color combo! This is adorable! I've often consdered the silhoette, now I may have to get one! I love this card! Your cut out card is adorable! Love how you did the sentiment. Congrats on your new toy! You did a fabulous job on the card! Looks like a winner to me! LOL I hope to "upgrade" soon, but not until the I dies. My DH would KILL me if I gave up the new machine. Even though I want to. Dang PC. And I love your card!! The colors look great! Very cute. Love it. Thanks so much for all the nice comments you leave on my blog. I know I don't visit as often as I should but I am going to work in it. Thanks for stopping by.